The napowrimo website today provides a link to Percy Shelley’s “A Defense of Poetry,” where he says most famously that poets are the unacknowledged legislators of the world. His belief is that poetry is magic and that poets are kind of like wizards. I’ll buy that. I mean, I don’t consider myself a wizard by any stretch, but I know the magic literature can work on the soul. I have read poems, and essays, and novels that have turned my mind and heart and my life absolutely upside down. So the assignment today, in Shelley’s honor, is to write a poem in which mysterious and magical things occur. I decide to talk about Percy’s wife Mary, and how her masterpiece worked on me, mysteriously, magically. To this day, Frankenstein is one of my all-time favorite novels. with this international tragedy. I was already shattered. but in the most mysterious and magical ways. of anger and guilt and ineptitude. So I did the thing. I wrote a book. I emerged as something whole and new. essence, something helpless that wants our love. my help. And I do what I can. I do what I can. So rather than create a poem advertising Burma Shave or a made-up product or some thing I dig and would like to promote, I thought, why not promote my own bad self and write an advertisement poem for my novel, Monster Talk? It’s terrible poetry, but I hope it will have an effect–because I could use the revenue. a story just as rich. learning to read and learning to love. and must find the strength to rise above. to read this novel by Michael Jarmer? Let’s recap, why don’t we. I do not have a history of being a very capable or enthusiastic self-promoter. I have difficulty asking people, cajoling people, insisting that people come to see my band play a show, for example, or buy our records. It’s not that I don’t think we’re worthy of their patronage, but that I feel somehow like I’m imposing on people. It’s awkward. It’s immodest. It’s uncomfortable telling people how great you are. But now I am turning over a new leaf. I am so pleased to be publishing a novel and feel perhaps more confident in myself as a fiction writer than I do in myself as a musician, I hereby vow to shout my barbaric yawp across the rooftops of the world, to impose a little, to tell people how great I am in order to get people interested in my new book, Monster Talk. In part one of this two-part blog entry, I established three initial reasons why you, dear reader, will love my novel. I gushed about the cover, the art, the artist who created it, the lovely picture of myself on the back and the flap, the effective, succinct, and tantalizing synopsis on the other flap, and the engaging sample on the back cover of the hardback. Reader, you are too smart to believe that a cover makes a book good, but you are also wise enough to know that good cover art and compelling cover text are both important aspects of the successful marketing of a novel, that, in fact, we judge books by their covers all the time. Okay. Monster Talk has a nice cover. I also insisted that if you love Mary Shelley’s Frankenstein, you will also love this novel, as its premise comes from that beautiful and so often misrepresented English classic. And finally, I argued that whatever your predictions or preconceptions about a novel by me about a subject like this might be, you would probably be pleasantly mistaken. In other words, I think, dear reader, that you will be surprised. So for what other reasons will you love my novel? #4. You like smart children and like them as main characters in stories. You like novels that are respectful of the wisdom, intelligence, and perspective of young people. And you like your child-main characters to be believable. They don’t have to have magic powers; they don’t have to be wizards in training; they don’t have to be vampires–and they don’t have to be monsters. #5. You may not be a huge science-fiction fan or a lover of what we call fantasy fiction, but you love stories in which the super-real crosses over or connects with the fantastic. You might enjoy magical realism as a genre. And why is it, exactly, that this kind of thing turns you on whereas interplanetary travel, space aliens, dwarves, elves and schools called Hogwarts leave you feeling unsatisfied? It might be, dear reader, that you read often for a higher purpose; you distrust literature that is purely escapist. And while you know that ALL fiction to some extent allows us to momentarily escape the confines of our daily lives, you have an expectation that the fiction you read reflects or illuminates some aspect of reality, some issue that is relevant, something that you recognize and can identify with. And you know that real life is often fantastic–the journey you’re taking in this life on this planet is often remarkable in the way that even a fire-breathing dragon can’t equal. So you’re totally down with the metaphoric power of magical, unnatural, supernatural elements in an otherwise realistic piece of fiction . Monster Talk is a realistic novel with a fantastic premise–and you’ll love that. #6. You love serious fiction that makes you laugh. #7. And finally, you love the fact that you are supporting an independent publishing venture. You understand that small press and independent publishing is often where our literature is richest, and you value the democratizing effect that new technology has made possible in the world of the word. So, for all these reasons, you will love my novel. Thank you, in advance, for your support. I’m telling the truth. Yes, I will indeed tell you why you’ll love my novel, Monster Talk, available to the on-line book buying public very shortly, a week or two, perhaps, after the publication of this blog entry, and available immediately, like right this minute, at the iUniverse bookstore. But I want to begin by talking about self-publication and the unavoidable weirdness that follows, that of self-promotion. So, if you’ve been following the blog you already know this, but if you’re just popping in for the first time, I’ll give you a short recap. I’m publishing my second novel first through iUniverse because I don’t have the time on the planet to exhaust like I did on my first novel–trying to find an agent who will then try to find a publisher who will then make me do what I have to do anyway as a self-publisher: promote my own thing. I just re-read that last sentence, the part about not having time on the planet. I don’t want you to misunderstand: I’m not dying–any more or less than anyone else who is about my age and health. It’s just that I found that publishing through the conventional means might take me the rest of my life. I have dismissed the illegitimacy issue. I have looked at my work and decided it is good. It is worthy of readers. I have embraced the brave new world of do-it-yourself-with-the-help-of-a-company-that-provides-everything-your-book-could-possibly-need-plus-the-means-to-get-it-into-the-marketplace technology. I have decided that, in the end, there is nothing different about publishing your own novel than producing and selling your own music recording, which is what musicians have been doing from time immemorial. That was the process and those are the subsequent conclusions. Now, having fulfilled my new year’s resolution in just 5 short months, as of today I have a book out that people can hold and read or use as a coaster, paper-weight, door-stop. It’s so good, though, I’m pretty certain people who buy it will be reading it. You, especially, will love it and will want to share it with others. More on this later. So now I have to promote. Promoting your own work, promoting yourself, trying to make your thing desirable to others, creating a kind of personal brand, is a strange, awkward, uncomfortable business. On the surface, it’s really no different from writing an entrance exam or an essay, written or spoken, for a job opening. You are a product, a product that has a variety of positive characteristics that someone else will want to take advantage of in exchange for some monetary or material reward. As strange as that sounds, it’s pretty normal. In the case of a work of art or a piece of music or a novel, there are some distinct differences. I am not my novel. My novel is not me. It is an artifact that came from me, a collection of many moments moving through me over time. You would think that would make it easier! But alas, not all of us are adept at separating the art from the artist, and our babies are kind of like babies. If someone hates our baby, we feel hated by proxy. And that’s scary. But despite that, if we want anything like success for our creative endeavors, we’ve got to get out there and shout our barbaric yawps over the rooftops of the world, saying, in essence, this thing I made is awesome and you need it and will love it and please give me money for my thing. This thing I made, a novel called Monster Talk, is awesome and you need it and will love it and please give me money for my thing. There, that wasn’t so hard. Let’s see if I can keep this up for a while. #1. Look at this cover. Lovingly created by my friend Curtis Settino, it is a quirky, inventive, and fitting illustration. 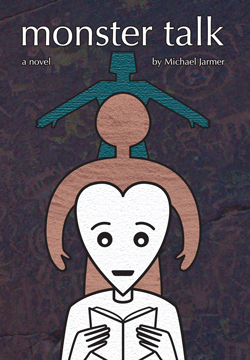 The novel’s main character is not someone who has a heart-shaped head–but the heart-shaped head captures an element that might be something else, beyond the cover, that you’ll love about my book. More on that later, perhaps. I want to talk more about this cover. There are other things about the cover that you’ll also love, I think. There’s a handsome picture of me on there. You’ll love that, I’m sure. I’m no beauty queen, but I’m no slouch either. You’ll also love the text on the cover. There’s a short little author biography, which you’ll love; there’s an excerpt on the back cover from the second chapter which, while setting up nicely the premise for the novel, thereby creating interest for you, the reader, will probably also make you laugh; and on the back of the softcover and on the inside flap of the hardback, there’s a lovely little synopsis that will pique your interest without giving anything away. I think you’ll really love this cover, and while they say you should never judge a book by its cover, all of us do anyway, and if you judge my book initially by its cover, you’ll probably end up wanting to read the thing and in the end you will end up loving it. #2. You will love the fact that my novel was inspired by another novel you love. Mary Shelley’s Frankenstein is about the best, most underrated, most under appreciated, most misunderstood because of a history of cultural misrepresentation, most influential novel of 19th century English literature. And if you’re not down with the preceding, Monster Talk will help you get down with the preceding. You will love that. If you are already down with the above, you’ll love it even more, because Monster Talk honors but doesn’t copy its predecessor. Except where it copies it. A little bit. You’ll love all of that.